It has been reported by many Bigfoot researchers that Sasquatch often walk with an inline step. In this particular trackway, found in the high country of Utah, there is definitely an inline step. 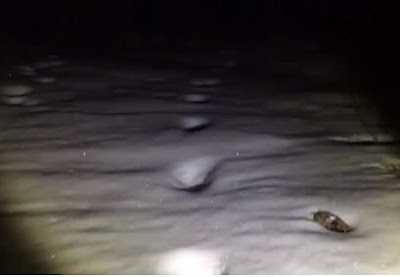 If this is a real Bigfoot trackway, then this is an amazing find. I was wondering if there are other animals that when jumping through the deep snow, would make an impression like this? I also don't rule out the possibility that this could've been hoaxed, but from the look of the distance between steps, it would be hard to do. That place looks like some sort of Sasquatch den! Great find and that dude needs to Go back often and see what if anything he can find. I just hope his dogs don't get grabbed up by the Sasquatch. It's been said that the Sasquatch doesn't really like dogs all that much. Actually it has been said that the Sasquatch hate dogs for the most part. Every once in a while somebody has a friendly encounter with their dog and sassy. But in general, it is all bad.